Spring Awakening! Scorpio, Your April 2019 Horoscope Is Here! Lets look at the month ahead in detail, Scorpio! For you, Scorpio, these rumblings and transformations occur in the zone of thinking and outlook, as well as your closest ties and local connections, and therefore you might be experiencing transitions around how you set boundaries with the most significant or pertinent individuals in your midst, and assert what you have to say. Bear in mind that these are long-term developments and not confined to April in particular. January’s new moon eclipse in Capricorn and the past two years of Saturn in Capricorn have also touched upon this area and the empowered perspective you now have. Depending on the seeds you’ve sown, the ties you’ve made, and your approach to developing your communication skills you may now encounter notable developments. On the 2nd and 3rd of April the moon will join Venus, Mercury and Neptune in Pisces, and the area of your horoscope governing creativity, children, artistic projects, romance, energising hobbies and exercise – really any kind of amorous interests, including dating! Mercury (now direct in this fluid, and potentially confusing realm) will be exactly conjoined Neptune, planet of delusion as well as higher thought. It’s an ideal weekend for reflection on lovers and your solo interests, considering projects that have recently been pertinent. Journal and bring your musings full circle. The New Moon in Aries arrives on the 5th April (at 8.50 am GMT) at 15º of the sign. This is a moment to claim a fresh start for work and your everyday schedule, for daily habits, health and wellness and the job you do. However you might not want to go full throttle in focusing on your position and the practicalities of everyday life. Sun and moon are in tension with planets at this new moon; your thinking and local connections (i.e. friends) could challenge the work you’re looking to seed and grow, and you may need to strike a balance between the plans you have (for work) versus navigating your own outlook or the thinking of those around you. Sunday April 7th delivers clarity – potentially through a conversation with a friend – as Mercury and Saturn align. It’s a time that allows you to make better sense of how you express yourself and a day to realise personal growth – how far you’ve come in connecting to others, communicating and honouring your romantic, creative or artistic side. It’s likely you’ve developed a new perspective in to relation to others – not only in love but also friendship. Mark it in your calendar as a day to reach out and be nourished by someone special. We’ve an interesting day Wednesday April 10th, as the vibrant success-oriented sun (in Aries) comes into tension with responsible Saturn; you may want to be practical, effective and crack on with your duties, demonstrating and proving you’re thriving in your position but go steady. Anticipate some kind of block that prompts you to slow your roll, Scorpio. At the same time, Venus, Neptune and Mercury in your passionate zone of creative urges will align with planets in the area of close ties and communication, inviting you to engage your personal desires and artistic notions, learning and indulging yourself with the support of those around you. It’s on this day, too, that Jupiter begins its retrograde, which presses pause on expansion in the area of work and income, finances and your independent earnings, which may have experienced a boost in interest since November 2018. Soon after (on the 12th) Mercury clashes with Jupiter, and on the 15th Venus clashes with Jupiter, which suggests that two areas of life may be struggling against each other (i.e. your practical position and material world versus romance, hobbies, fun and love interests). It’s been challenging for Jupiter since he entered Sagittarius back on November 8th, with planets in Pisces overwhelming his ability to flourish and bloom, and it could continue to be hard to embrace the full potential of Jupiter this year. Jupiter Retrograde offers a chance to think over your money goals and growth in your job, how it’s developing and will continue to evolve. Easter weekend begins with the second Full Moon in the zodiac sign Libra, Friday April 19th (11.12 am GMT). 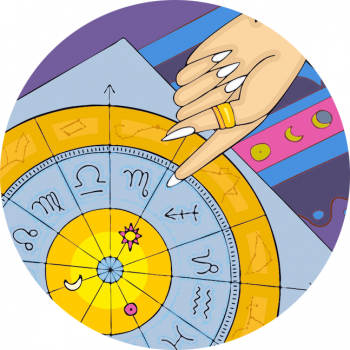 The moon peaks at 29º Libra, a moment to really dial it back, Scorp – surrender fully! With the moon peaking in your zone of closure, dreams, healing, detox and transition you’ll need to shine a light on how you’ve let go in the last eighteen months. What shifts have been most pertinent? They may come up for you now, and may be related to partnership and personal relations. The sun then moves into Taurus, giving you a chance to focus on one-to-ones. This is an awesome time to meet someone to collaborate with (in love, business or friendship) and begin to improve your sense of happiness in a pair (though it’s later in May relationships will really fall into place). On Sunday April 21st Venus moves into Aries, signalling a time work life and routines will begin to improve, all in all the end of April makes for a great time to look outside yourself and towards teamwork! Motivator Mars enters Gemini on the 31st March, and spends April moving swiftly through your zone of private investments, commitments, shared resources and property. You could be keen to tackle your taxes or address issues in shared spaces (home, studio or office) or be looking at bills, paperwork and how you divide these responsibilities among a partner, sibling or friend. On April 27th, Mars will clash with Neptune in Pisces, so that while part of you is keen to indulge a sense of pleasure and enjoyment, another side is considering the long-term costs and ramifications. Balance accordingly.